Our students include children, people who are learning classical or jazz music to a professional level and also older individuals who want to learn stringed musical instruments as a hobby. Therefore anyone who has an interest in stringed musical instruments, from beginners to professional musicians, can be accommodated. ※ For inquiries or registration, either contact us on the contact page of our website, Contact form or go directly to the website of the teachers. He had educated at Osaka University of Arts. He has been familiar with guitar since his young age, he has affected by such as such as the Beatles and Simon & Garfunkel. He had exercised the lag time blues style by Mr. Junji Ariyama's lesson for three years. In addition to play the guitar, he also perform the flat mandolin. 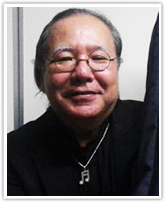 He has lessons at the music club as an external trainer at the evening classes of the Osaka Prefectural Kasugaoka high school. Tomoo graduated from Tokyo College of Music. His contrabass teachers was Mr. Yasushi Akamatsu and Mr. Takemasa Matsumoto. He has the experience as a contrabass player in the "Kansai Philharmonic Orchestra" and as a part-time lecturer in Kobe College. He is a principal contrabass player in the "Orchestra of The College Opera House of Osaka College of Music" now. Eriko graduated from the Music Department of the Kyoto City University of Arts. She participates in the Kyoto Symphony Orchestra. In addition to the violin and viola, her skills are still growing to include the zampoña, quena and drums. Kenkichi was born in Kagoshima. He has loved music since a young age, when he joined a chorus group. He has worked as a singer-songwriter since the age of 12. At the age of 16 he started listening to Jazz, and since then has devoted his life to it. He has continued to perform live house in the Keihanshin area since the age of 20. Beside his band activities, Kenchiki is the bass player for gospel singer Yuko Ichioka and the bass player of 'Bonchi Osamu Band'. In addition he also has experience co-starring with a large number of overseas musicians. In 1999 he formed a band, 'The Keeping Good Company', and runs live concerts celebrating a variety of guests with the trio. He also runs concerts in nursing homes and other places as a volunteer. With regards to other courses, such as viola, cello and guitar, please contact us directly.